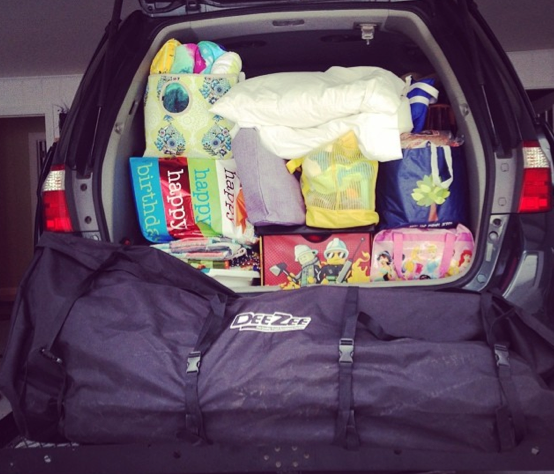 We’ve never used my “cargo shelf” on the minivan before (it usually has a bike rack on the back), but we wanted to keep the beach toys, chairs, and other outdoor equipment separate from the suitcases, cooler, and other items that would (hopefully) not get covered in sand. And, our 7-year-old needed a place to sit in the 3rd row. We left about 10am, stopped at the welcome centers in South Carolina, North Carolina, and Virginia before stopping for the day/night in Richmond. My next post will include what we saw and did during our few waking hours there. Months ago, when my mother-in-law suggested her two daughters and their families spend time together in the town where she lived until turning 10, and I realized the week planned fell immediately before a conference I’d already scheduled in FL, our assumption and plan was that we’d fly to DC, back to Atlanta, and then drive to FL. However, the cost of 5 airline tickets and renting a large vehicle is enormous. And even more importantly, I want my children to see their country. Outside of my family, I don’t know anyone who’s been to all 50 United States like I have. The reason I was able to visit the first 30-something of them is because my parents took my brother and me across the country (from Nashville to L.A. and from Nashville to Alberta a few years later) in an ’83 Suburban twice. We saw national parks, battlefield monuments, state capitols, museums, scenery, and a lot of motel swimming pools along the way. My parents helped foster a love of traveling and exploring in my brother and me at young ages. There really is no other way to feasibly see our country as a family but by traveling through it by car. So, that’s why we’re spending 10 days driving through 7 states (+ D.C.) for 30 hours and covering over 2,000 miles this week. I just feel lucky you left room in the passenger seat for me. There was just a lot a LOT of stuff to pack.